Abstract: For more than a decade, stakeholder needs assessments and reports, including the recent National Climate Assessment, have pointed out the need for climate “science translators” or “science integrators” who can help bridge the gap between the cultures and contexts of researchers and decision-makers. Integration is important for exchanging and enhancing knowledge, building capacity to use climate information in decision making, and fostering more robust planning for decision-making in the context of climate change. This talk will report on the characteristics of successful climate science integrators, and a variety of models for training the upcoming generation of climate science integrators. Science integration characteristics identified by an experienced vanguard in the U.S. include maintaining credibility in both the scientific and stakeholder communities, a basic respect for stakeholders demonstrated through active listening, and a deep understanding of the decision-making context. Drawing upon the lessons of training programs for Cooperative Extension, public health professionals, and natural resource managers, we offer ideas about training next generation climate science integrators. Our model combines development in interpersonal relations, communication, project implementation, effective education, and disciplinary knowledge. This brief presentation will be followed by a freewheeling discussion and exchange of ideas on these topics. Gregg Garfin is Assistant Professor in Climate, Natural Resources and Policy, in the University of Arizona’s School of Natural Resources and the Environment, and Deputy Director for Science Translation and Outreach in the University’s Institute of the Environment. His training is in geography, climatology, and paleoclimatology. He has worked for the last 13 years to bridge the science-society interface, through dialogues and collaborative projects between scientists and decision-makers. His research focuses on climate variability and change, drought, and adaptation to a changing climate; geographic interests include semi-arid regions, transboundary regions, and monsoon climates. He has convened training workshops for natural resource managers and others, on drought planning, climate change, adaptation planning, drought monitoring, and other climate-related topics. He has had the good fortune to work on climate change adaptation projects with really smart people from NGOs, cities, private consulting firms, academia, and the Federal government. 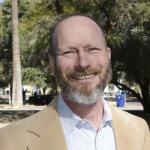 He serves on the City of Tucson’s Climate Change Advisory Committee, the North American CORDEX Executive Committee, the Southern Climate Impacts Planning Program Stakeholder Advisory Committee, and the North American Climate Services Partnership’s Rio Grande Pilot Project Leadership Team. He recently led a 120-author effort to synthesize information on climate change and its impacts in the Southwest, as a contribution to the 2014 National Climate Assessment. He is co-convening lead author for the Southwest chapter in the forthcoming National Climate Assessment.